This bird is usually seen perched high in gum trees on the campus. 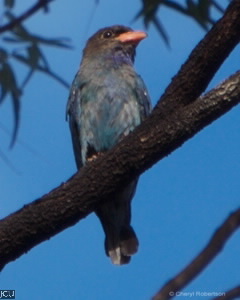 Head and neck are dark brown with a blue patch on the throat, wings are deep blue with some green, remainder of body is dull green with blue patches, in flight large white patches are visible on the underside of the wings. Legs and feet red, eyes dark brown with red around, bill bright red.